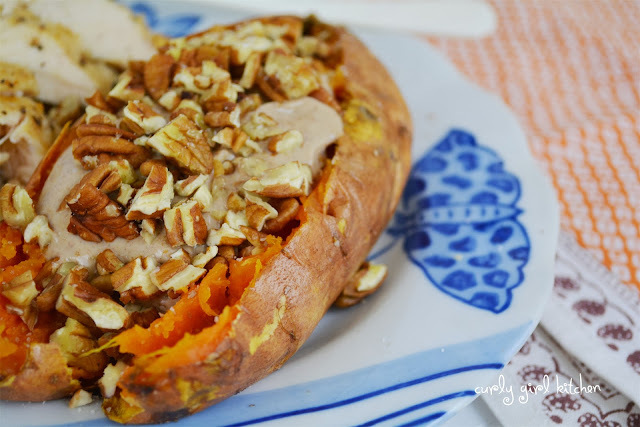 We eat sweet potatoes at least once a week, and with only so many ways to cook them - not including my favorite sweet potato casserole - we generally rotate between roasted, baked or mashed. To keep them from getting too mundane, I'm always trying to think of new ways to make them a little more interesting, while also maintaining their intrinsically healthy properties. I've been looking forward to making sweet potato casserole for Thanksgiving, and I make it like my mom always has, with a buttery, brown sugar pecan streusel topping. It's a dish I look forward to all November long. 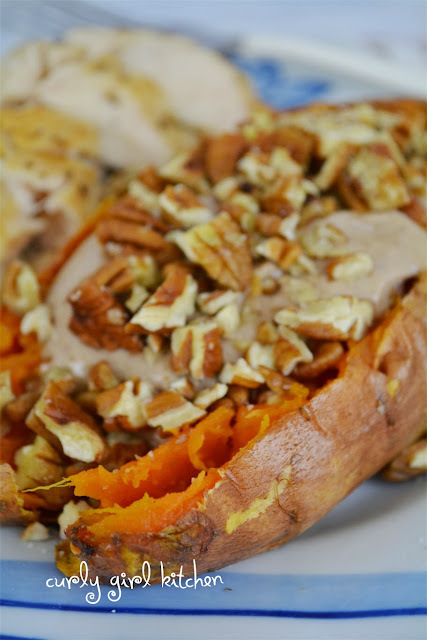 So for a nutritious weeknight meal that was reminiscent of the flavors of my favorite casserole, I baked the sweet potatoes until tender, then topped them with a lightly sweetened dollop of Greek yogurt that I spiced with cinnamon, nutmeg and vanilla, then sprinkled each potato with a handful of toasted pecans. Preheat the oven to 375. Rub the potatoes all over with the olive oil and wrap each in foil. Bake for one hour, or until tender enough to pierce with a fork. In a bowl, combine the yogurt, brown sugar, cinnamon, nutmeg and vanilla. Refrigerate until needed. Top the baked potatoes with a spoonful of the yogurt, and sprinkle with the pecans and salt.